Did you know that you can get loads of gift cards from shopping online? No I don't mean buying gift cards, but getting cash back when you do your online shopping! That's what Swagbucks does: for every dollar you spend via Swagbucks Shop, you'll earn SB (they vary from 1 SB per dollar to even 40 SB per dollar and they're changing all the time). By shopping online at big retailers like Walmart, Amazon.com, eBay, Target, Best Buy and more, you're getting SB to turn into gift cards! But guess what? Swagbucks is giving you even more! 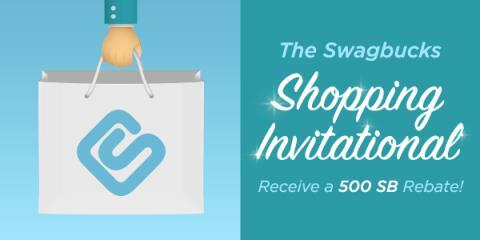 From now through Nov 30th on Swagbucks.com, when you make at least one (1) shopping purchase per month for 5 months (July, Aug, Sept, Oct, Nov), you'll receive a bonus: a 500 SB Swag Up Rebate! That rebate is enough for an additional $5 gift card on top of your normal Swagbucks shop earnings!! There's no minimum purchase amount, just shop as you normally do each month, and make sure to do it through Swagbucks. If you earn the Swag Up, the 500 SB Swag Up Rebate will be available from December 1st through December 31st. So what are you waiting for? Sign up today and turn your online shopping into cash back and a 500 SB Swag Up Rebate!